The Blessing Angel Figurine by Anne Stokes. 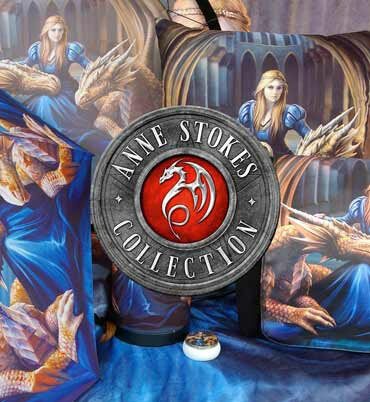 Coming from the enchanted imagination of magically talented Gothic and Fantasy artist Anne Stokes, this beautiful angel figurine is exclusively available from Nemesis Now. On a floor checked with black and white tiles, an angel dressed in white kneels on one knee, white feathery wings outstretched behind her. Her long white robes flow down to the ground as she looks up, raven hair falling over her shoulders. In her hands, she grasps a plain iron sword by the blade as she holds the hilt up in supplication, looking up to the being she is swearing fealty to. Cast in the finest resin before being lovingly hand-painted, this magical statuette is a fantastic addition to any mantelpiece.